When I had the pleasure of catching their set at The Spot Underground here in Providence, I wasn’t sure what I was in for. I had never seen a solely instrumental band live before and thought there might be a void without vocals. I could not have been more wrong. Mammal Dap has an unbelievably commanding sound that is both complex and exciting. I danced around and grooved just as much, if not more, to Mammal Dap as I have at any other shows. The four mammals, Killian Karlsson (lead guitar), Reed Sutherland (Bass), Colin Jalbert (drums), and Zach Cross (keyboard), skillfully create an R&B soulful feel by mixing elements of indie-rock, jazz, hip hop, and EDM. How can you go wrong? The group recently released their first full-length record, an 11-track album simply titled Mammal Dap, on vinyl and just ended a month-long tour promoting the record. You can stream, download, or buy a physical version of the new album (which--by the way--has a pretty rad needlepoint cover artwork) here. Give them a listen and find some more sweet stuff on their site, http://mammaldap.com . 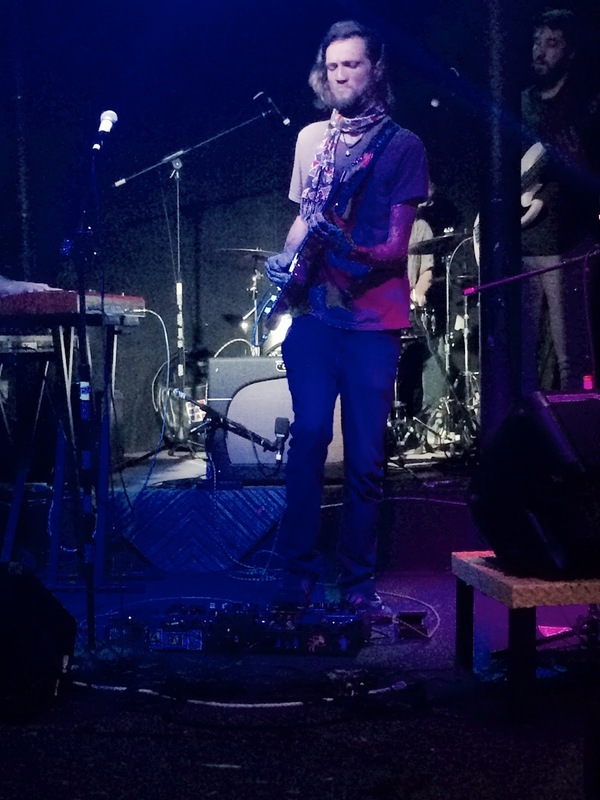 In the meantime, keep reading to hear a little bit from Killian and the band about their background, live shows, and even some tips for the aspiring college musician. How did you all meet and start playing music together? We were all in different projects in our music community and mostly just knew of each other. At one point in time, however, three of us ended up in the same project and realized that we needed to form our own band. Zack and myself got together and wrote a few tunes, and when we first played together it was definitely a special moment. We later added a tune that came out of a jam session, and quickly threw our first EP together. What’s the story behind the name Mammal Dap? We wanted a name of something universal that connects us, and creates a strong image. Over some Chinese food, and many ideas shot back and forth, the name kind of just dropped out of two separate mouths. I love the description of your sound on Bandcamp. Besides Hall and Oats, Madlib, and the Beastie Boys, do you guys have any other major musical influences? I would say that our biggest influence comes from a single idea, playing music that draws from lineage, but is made fresh and relevant by modern innovations in technology and sounds of the modern world. The electric guitar changed music forever, as did the synthesizer, as did DJ’s, drum machines, sampling, and computers. We like to create organically, and then record, overdub, sample, and then bring it back full circle live again. Some musical influences would be anything from the 80’s; Prince, Michael Jackson, Herbie Hancock, and Madonna. But a ton of others like Knower, RH Factor, Squarepusher, D’Angelo, Kendrick Lamar, Vulfpeck, JDilla, Flying Lotus, Thundercat, and Daft Punk. You guys recorded and produced your latest full-length record in your “living rooms, bedrooms, and basements” over the course of one year. What was that process like? Any favorite moments or challenges? There are always hilarious moments during recording. There’s often an energy that things are on the line, and strange things go wrong that normally wouldn’t. The first bulk of recording was during a flash flood that completely flushed out the studio in the basement of our bassists place. So we had to move everything rather abruptly. After this we spent at least an 18-24 hour period sorting out malfunctioning computer hardware. After several exchanges, software updates, and car trips for different cables, we realized that the only thing that was wrong was that we kept nudging the cable accidentally, causing the malfunction. Hilarious in retrospect. We were, in essence, being timed during this since we got to borrow some very amazing mics from the lovely folks at Telefunken for a 48 hour period. So most of the record was made in a couple days. It is hard to say what the best part of recording is. The whole process is often a very zen-like battle with your mind in the moment, perfection versus vibe and expression. Acceptance of where you’re at and what you can get down. Or relentlessly doing take after take until you finally nail it. Occasionally we hit a deeper level of ourselves that creates those magical moments for each of us personally, and hopefully for our audience too. This new record has so many great nuances and sounds. “Rising Suns” sounds like the perfect intro song to a rad indie film, while “Tried Tides” has a wonderfully whimsical vibe that feels almost like you’re in an awesome underwater world. When listeners make their way through this album and hear all the songs, what do you want them to feel? What kind of situation do you see your music accompanying? The beauty of instrumental music is that it leaves the listener [open] to feel and imagine whatever comes to heart and mind. The emotional content is something that transcends preconceptions. What is, of course, great is when the song does have a specific story to tell that people magically pick up on. So far we have had our music accompany a couple different short film ad’s, but having something in a rad indie film would be a dream come true. Either way, any context that our music is played in that brings joy with our vibes is our goal, cruising down the highway, or just chillin in your own zone. During your show at The Spot in Providence, I noticed some pretty rad improv. Colin at one point went into a killer drum solo, and Killian showed off some mad skills on the electric guitar. Is that something you guys have always done in your live shows? How does it affect the chemistry on stage? Well, thank you very much! Yes, you could say the core of our sound is improvised music, but we also like to play composed [pieces] as well. We like to have improvisation be a highlight rather than a focal point. In many instances we dislike that jazz can be so focused on improvisation that it can sometimes take away from the actual song. We are avid jazz fans, and have been for years, but we aren’t afraid to openly explore concepts and ideas that we would like to see more of. Improvisation should serve the music, and not be a competition. Obviously we all work extremely hard to become better improvisers. After all, this is how many songs are born. But we love listening to beat tapes without any improvisation too. We like to bring both of these worlds together for our audience. Do you think your sound changed from your first EP, 5lbsHigh5, to this new full-length album? If it did, how? Yes, we would certainly like to think so! I would say it has grown more realized. We always have an interaction and exchange with our audience. Who we play music for influences us and what we write. When we get feedback about what people like about our sound, we hone in on those aspects of our compositions. We also just keep growing musically, so we just keep writing what we love, and refine who we are as people. You guys all studied music in college, except for Reed, who studied graphic design. How did studying music in school affect the kind of music you make today? The school system can grill you into fact collection, regurgitation, competition, and putting a value on certain genres over others. We dislike that we have had to decompress from school in this way to some degree. We love all kinds of music from 50’s country, to 90’s house, Taylor Swift, to classical, world, rock and so on. In short it has made us go back to our hearts and play the music we love. Some people seem to react negatively to the more technical side of things, but we try to be true to ourselves. School also had amazing moments too. It gave us much of what we needed to become who we are musically. Any tips for college kids studying/making music right now or who want to potentially make music in the future? Just be true to yourself. There are ways to honor what you love and incorporate the knowledge you are learning and craft it into an amazing piece of art that only you yourself can share with the rest of us. Please have courage and faith that being creative is one of the best gifts that you can give to the world and the crazy place it is. You are the future. You guys just ended the “Empire Strikes Dap” tour to promote your new vinyl release. What are your plans for the future? Right now we are amidst a wonderful evolution that has led to our new bassist Reed Sutherland! We have already been writing new material and plan on recording it as soon as we are happy with the tunes, and putting out a new EP that is even more fully realized with new inspiration and energy. If you could tour with any artist or band as a headliner or opener who would you want it to be? Do you guys have a favorite show you played over the past year? What made it special? Anything else you want our readers to know about your music?